If you’ve ever been tempted to consult some sort of charlatan who claims to be able to tell the fortune then you may well be interested in this online slot from Amaya Gaming. It’s called Fortune Teller and it’s theme is of course that pseudo-sciene which suggests that tea leaves can predict your future. This game should not be confused with Net Entertainment’s Fortune Teller which you can read about by clicking here. 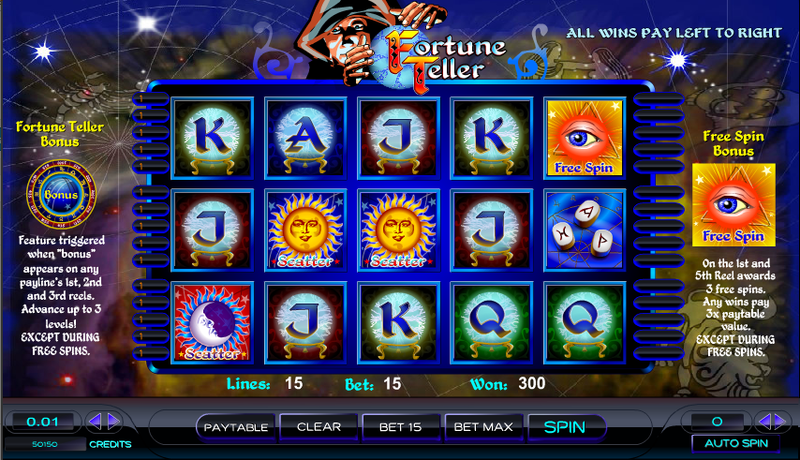 Fortune Teller is a five reel slot with fifteen fixed paylines; the backdrop to those reels is a nicely designed starscape overlaid with constellations and signs of the zodiac. The lower value symbols are J, Q, K and A inlaid onto crystal balls while the higher values include a burning candle, a set of tarot cards, runic dice and a palm waiting to be read. The Fortune Teller is wild, there’s eyeball symbol which activates the free spins and a calendar wheel bonus symbol for the main feature. The sun and the moon are scatters. There are a paltry three free spins available and they are triggered by landing the eyeball symbols on reels one and five on the same spin. Any wins are multiplied by 3x but you can’t re-trigger the spins from within the feature. 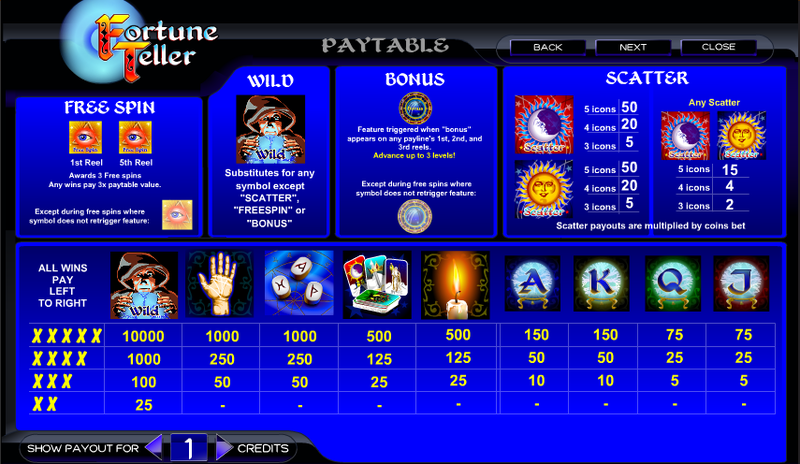 This mini-game is triggered by landing three of the bonus symbols on an active payline on reels one, two and three. You will now be faced with a calendar wheel and you must pick arrows to spin. One or two arrows pointing towards the sun symbol will advance you one level up and there are three possible levels, each offering greater prizes. All other positions win you cash rewards. Aside from the rather silly premise this is a passable slot with two reasonable bonus feature. The sound effects are predictably annoying but those can be turned off easily enough by using that mute button.